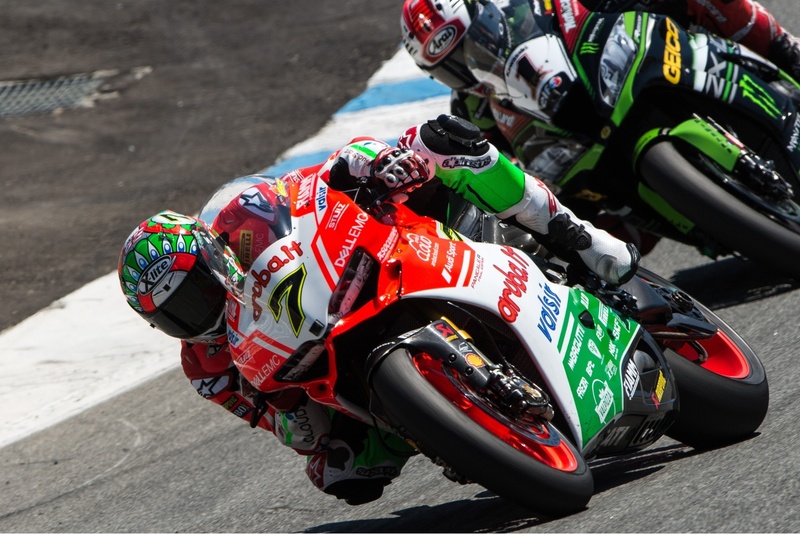 Just three weeks after being injured at Misano, Chaz Davies (Ducati) returned to the top step of the podium following Race 1 at Laguna Seca earlier today. Staying close to Davies for most of the race, Jonathan Rea (Kawasaki) had to settle for second place, while his teammate Tom Sykes finished third. You will find full Race 1 results here. For additional details and points, visit the official WSB site. Stay tuned for a report on Race 2 tomorrow. Just glad to see Chaz back on a motorbike. The accident @ Misano could have gone terribly wrong. Chaz has been here before racing in the good ol’ USA in the AMA class. As for the competitive racing so far this year in WSBK, Kawasaki has put forth tremendous effort and has two extremely talented riders. Chaz is riding the wheels off the Ducati. Yamaha has made progress as well. Honda, BMW, Suzuki, as others all need a little more support / help. Lets be thankful we still have WSBK racing here in America. I wish I could attend a (WSBK) race here in the East Coast. Barber, NJ, COTA ?